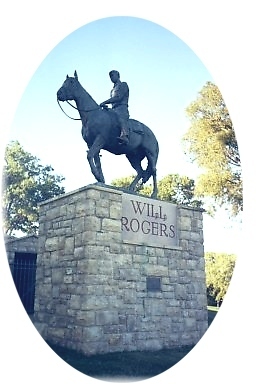 We invite you to visit where we live, where the likes of Will Rogers grew up, along with astronaut Stuart Roosa, and Mrs. Sam (Helen) Walton, the recently retired JC Penney Chairman of the Board, W.R. Howell, where singer Pattie Page was born, where long-time and famous rodeo announcer, Clem McSpadden lives, where author Lynn Riggs wrote about his youth growing up in the area through his story "Green Grow the Lilacs" which Rodgers and Hammerstein transformed into the beautiful production of "Oklahoma!" Andy Payne from the Foyil area won the first "transcontinental" foot race referred to as the Bunion Derby in 1928. Who knows what future notables are growing up here now! What is now Claremore, Oklahoma was once a vast wilderness practically uninhabited except for wild animals. In 1802, a band of Osage Indians settled on a 25 acre mound along the Verdigris River. The mound became known as Clermont, French for "clear mountain" and Glahmo, the osage chief became known as Chief Clermont. After the infamous "Trail of Tears", the Cherokees were given title to the land, and the Osage were removed to a reservation, later called Osage County. The Cherokees were remarkable people. They prospered, organized constitutional governments, established towns, published newspapers, magazines and books, and established an extensive educational system. The Historic Tour of Claremore is not just about places, but the story of people and the Indian heritage that is woven together to make this a little city with a big Hall of Fame.